← Boston PD Bomber Suspects Manhunt: So That’s How You Take Back a Neighborhood? 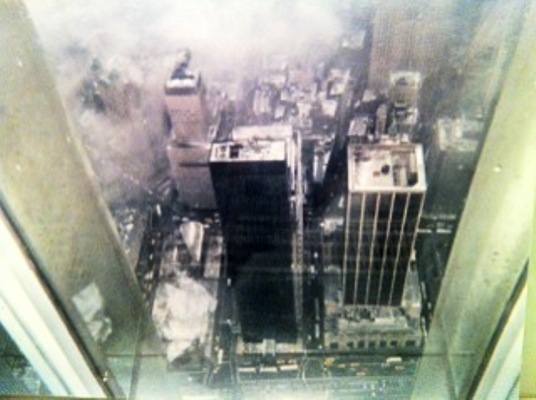 Looking through some old papers tonight, I found this 35mm photo I took on January 15, 1999 from a 106th floor window of what used to be the World Trade Center in New York City. You will notice the clouds from this bird’s eye view. Tragically, this vantage point is practically no longer available. Can someone please tell me why? Currently serving as Chief Operating Officer of Alejo Media, emerging as one of Washington, D.C.’s most artistic and innovative video production and post-production media companies. Previously, as Director of News and Media Services at the American Institute of Physics, he led the creation of the InsideScience.org news platform, which includes Inside Science TV. He also previously served as Media Director, Energy NOW! and Clean Skies TV and as Special Reports Editor/Media Relations Director at The Hill newspaper. Jim has served in various executive, business development and/or programming roles for a number of media concerns including CBS Radio/Television, Radio One Inc. and the Los Angeles Times. Since 1995, he has been a contributor to the Reporters Notebook news roundtable program on NBC 4 TV, DC. He earned a music scholarship to Delaware State University, a Bachelor of Arts in English/Television Production at Virginia State University and, from 2003-2007, attended Concord University School of Law. His commendations include the Washington, DC Teachers' Union Media Relations Award and shared an American Academy of Nursing National Media Award. Jim also chairs a development task force for the faith-based, non-profit House of Help/City of Hope, founded and led by Bishop Dr. Shirley Holloway, which has provided substance abuse, mental health and continuing education programs and transitional housing for tens of thousands of homeless (and battered) women, families and men (including ex-offenders) at its shelter and treatment facilities in Washington, DC and Prince George’s and Charles Counties, MD. Aside | This entry was posted in 2nd Amendment, Energy and Environment, Gun Control, Gun Rights, Jesus, Media, Mental Health Counseling, NRA, Politics, Religion, Spirituality and tagged 9-11, Boston Marathon Bombing, Terrorism, World Trade Center. Bookmark the permalink. Maybe someday we’ll understand why … maybe … then again, I don’t think there is any reasoning that will lead us to understand – not so long as we exist here on Earth anyway. Your photo, by the way, is beautiful – I think it should be framed! Submitted to Time Mag. or something … and include your caption about wanting to know why it doesn’t exist, not even for the birds, anymore. Lovely. Thanks for sharing your photo. I’m afraid there is no true explanation of evil. Thank you so much for taking the time to write! Reblogged this on Kg4zxk's Blog. Reblogged this on Keith's World. Because ( yes, Virginia) some religions are inferior to others. One particular creed that has been stuck in the 6th century for a long time likes to scream “Allah Akbar” as they do very un-neighborly things to their neighbors and fellow human beings. Sometimes they destroy large buildings in the process. A different and far better creed teaches “love God with all your heart, soul, mind, and strength and love your neighbor as yourself”.